Gift certificates are just a click away… Instant online gift certificates are a simple way to tell someone you love them! Choose your custom amount and gift card style, then click and pay in a jiffy. Anazao means to be reborn, renewed or revitalized. 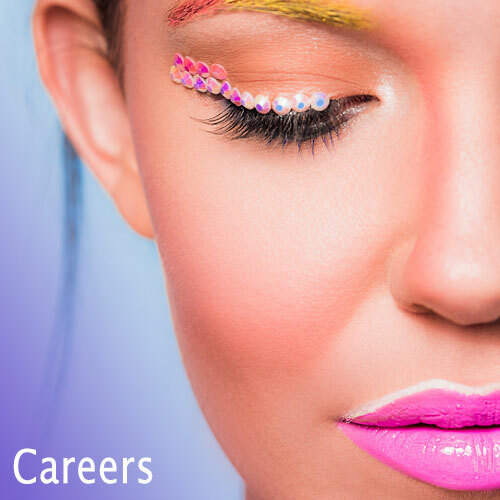 Our team of expertly trained hair stylists, makeup artists and estheticians are here to help you look and feel amazing. 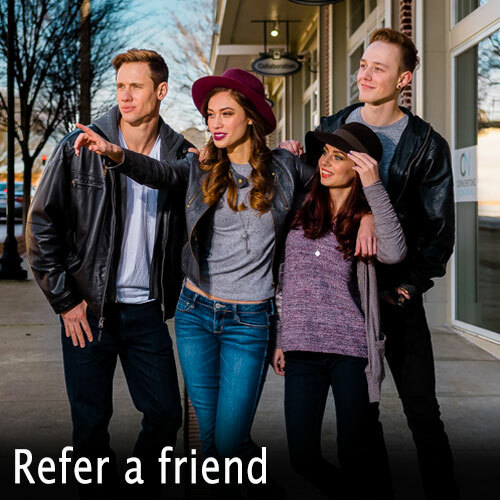 We’re an award winning, Aveda Concept hair salon for women and men, offering hair cuts, hair color and a wide variety of texture services like perms, straightening and smoothing. We also offer makeup, skincare, waxing, bridal services and more. 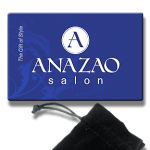 Anazao Salon is located conveniently east of Atlanta in the heart of Snellville’s shopping district in the Presidential Market shopping center. 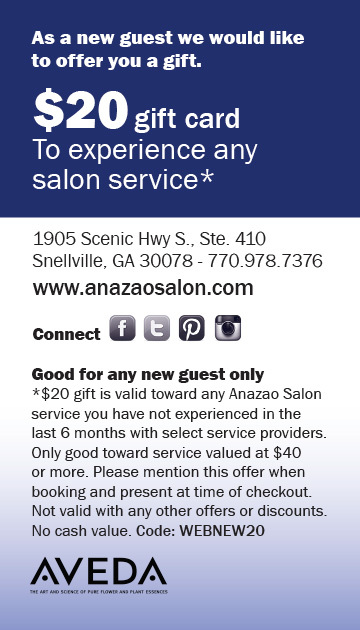 We know you’ll love the experience and service you get at Anazao so we offer a gift for you to give us a try. Come be our guest, you’ll be glad you did. 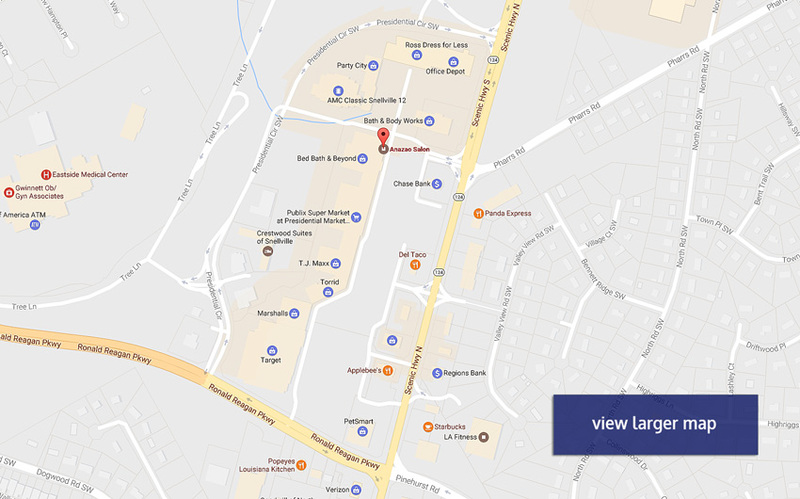 We’re conveniently located in the Presidential Market shopping center at the intersection of Scenic Hwy & Presidential Cir. There’s plenty of free parking as well. If you need to do some shopping or dining while you’re out, Presidential Market and the neighboring shopping centers have a plethora of great businesses to take care of your needs. We look forward to serving you! Wonderful experience. Amanda was awesome. Such a nice person who made me feel so comfortable at my first experience at a hair salon and getting a facial in Georgia. Will definitely be going back again. I'm a tough customer and I pay attention to everything. Everything about Anazao is friendly and professional and I always enjoy my visits there with Jody and her associates. Keep caring folks and thank you! From the first phone call, to walking in, being serviced and leaving, I felt welcomed the whole time! Everyone was so friendly and personable. Catherine did a phenomenal job on my hair and boosted my confidence. I cannot believe I have found my go-to place now! Thank you Anazao!! Be back soon! We have ladies cuts starting at $30 and cuts for men starting at $18. Our team of beauty professionals are experts with hair cuts, hair color, cosmetics, skin care, waxing, bridal services and more. We are an award winning Aveda Concept hair salon with an outstanding team of style professionals for every budget. 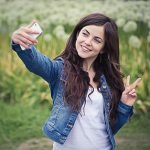 You deserve a great salon! 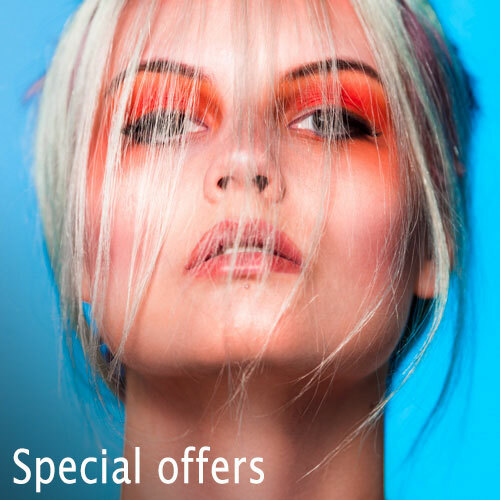 Whether you’re a new client or a regular guest at Anazao Salon, we have a variety of special offers available just for you. 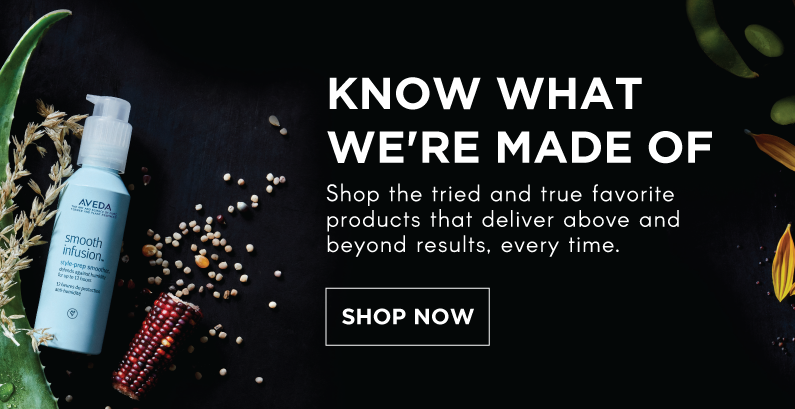 We offer occasional seasonal savings on services and retail products as well as trial offers on some of our new services. 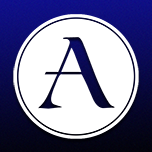 The easiest way to stay informed about what’s going on at Anazao is to join our mailing list. You can also bookmark our special offers page and visit as often as you like.